You once had six kidneys, and no you’re not an alien! This article is the first in a series of articles that relates back to the name of this blog. 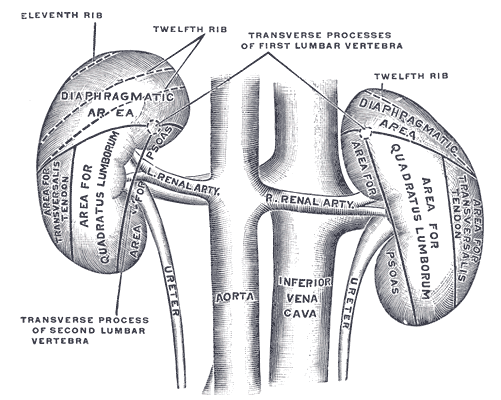 Darwin’s Kidneys is the blog name and also the name of the book that I am currently in the process of writing. It is an attempt to illustrate the convoluted evolutionary path that kidneys have taken down our ancestral line. More importantly, it is an attempt to highlight the importance of the kidneys in allowing animals to adapt into new environment along that evolutionary road. In the case of our ancestors, and all land vertebrates, that road began in the oceans, detoured into fresh water habitats, then rose up onto dry land. Be aware that that is simply the road that lead from the first animal ancestors to humans. Other animals began at the same starting line, but took different turns along the way, sometimes taking them far from where our particular road has taken us. In many cases, the road for certain creatures came to an abrupt dead end, as extinction ended that journey. Along the way, kidneys helped creatures survive by keeping their internal environment stable even as they moved into environments very different from which they originally evolved. To meet those new challenges, kidneys had to evolve to prevent the internal environment from reaching chemical equilibrium with the external environment. So what’s all this about you having had six kidneys? Well, our earliest development betrays something of our evolutionary past. Think back to when you were just a little fetus in the womb. I know, it was a long time ago, but think hard. As a fetus you didn’t have to worry about very much. Mom took care of you. For instance, you didn’t need kidneys to clean your blood back then. That’s what mom’s kidney’s were doing for you through the intermediate organ of the placenta. The placenta, which is the only organ that was part you and part mom, was the portal between the two worlds. The nice warm watery world you were floating in, and the harsh outside world that you had no idea you would be rudely tossed into in a short 9 months. But, since you were going to need kidneys when the connection between the two worlds was eventually lost, your genetic programming was instructing your developing body to start making kidneys. You might think that a good way to make kidneys would be to have certain cells in your developing body begin to transform into kidney cells, and arrange themselves into the proper architecture to create the complex tubules, glomeruli, blood vessels, and so on necessary for a functional organ we know as the kidney. That would probably make a lot of sense to an engineer, architect, or designer, but that is not how nature decided to go about this particular project. To make human kidneys, or any mammalian kidneys for that matter, we first have to go through two false starts, then finally get to the real deal. Your first set of kidneys starts to take place somewhere around where your upper chest or neck will eventually be, when you are a mere 22 days gestation (ah, the joys of youth). Tissue known as the intermediate mesoderm receives chemical signals, called morphogens, from the nearby anterior somites to start forming a duct named the pronephric duct. These morphogens effect which genes get turned on or off in the cells that come into contact with them. Cells in the pronephric duct then begin a migration to nearby tissue and cause more of the intermediate mesoderm to start forming little tubules. By the way, tubules are what the kidney is all about, so tubules are a good start at this point. These tubules form the pronephros. Nephros refers to kidney, and pronephros doesn’t mean “go kidney!”, it means first kidney. Why? Because this is your first set of kidneys, but luckily not your last. Now if you happen to be a fish or an amphibian, this is about as good as it gets. These are the final kidneys for these groups of creatures. In mammals the pronephros is not thought to be functional, but keep in mind that as mammals, our distant ancestors included fish and amphibians – hint hint- so our non-functional pronephros may be evolutionary baggage that we are stuck lugging around from generation to generation. The pronephros begins to degenerate not long after it forms, but before it does so it produces a duct that begins to grow in a downward direction towards the lower body. This duct is called the nephric duct, or sometimes the Wolffian duct, secretes chemical morphogens in the the tissue below where the pronephros had previously appeared then disappeared. This time the morphogens secreted by the pronephros start the generation of tubules in our second pair of kidneys – the mesonephros. In humans the mesonephros forms around day number 25, but alas, it too has only a brief ethereal existence and begins to degenerate soon after forming it’s mere 30 or so tubules. Curiously, while the mesonephros doesn’t appear to filter blood like an decent kidney would, it does have some interesting functions and lead to some important structures. For one thing it happens to be an important site for the production of blood cells in the early fetus. The so called, hematopoietic stem cells begin to form in the mesoderm at the aorta-gonad-mesonephros region (AGM). So your second pair of kidneys is important as an early red blood cell production factory. The hematopoietic stem cells jump ship, however, as the mesonephros eventually disintegrates away, and they travel to the nearby liver where they reside for another brief interval, producing blood cells for the fetus. Eventually they move on from this location too, and set up shop in the bone marrow, where they eventually settle down for the long duration of your adult life. The second important legacy left by the mesonephros is that some of the tubules become components of the male reproductive tract. The tubules of the mesonephros connect the Wolffian duct to the testis and the Wolffian duct itself transforms into the epididymis and vas deferens of the male gonads. In female, lower levels of testosterone allow degeneration of all the Wolffian duct structures so these male structures don’t form in the female fetus. In the mean time, as the mesonephros follows the unfortunate fate of the doomed pronephros, the Wolffian duct continues to grow downward on it’s journey towards the pelvis. When it reaches a certain patch of cells, called the metanephric mesenchyme (MM), it pops off a little shoot called the ureteric bud. How the ureteric bud knows where to sprout off the Wolffian duct and which direction to grow is due to it having received an important, and tongue twistingly named chemical signal from the MM called glial cell line-derived neurotrophic factor or the easier to say GDNF. The bud cells have protein receptors that can recognize the GDNF diffusing into the area. Experiments where mice had their GDNF receptor gene deleted failed to form kidneys at all, illustrating the importance of this chemical interaction for renal organ development. The ureteric bud then kindly replies to the MM with it’s own suite of chemical morphogens which tell the MM to please not die by apoptosis (apoptosis is programmed cell death and is an important means of removing unnecessary tissue during organ development) and then to cause the cells to begin to cluster around the bud itself. Further chemical interactions between the MM and ureteric bud cause the bud to begin branching, like branches and twigs on a tree, and for the cells of the MM to transform into epithelial cells and arrange themselves into tubules. This time -third times a charm- the tubules don’t disintegrate, as they did with the pronephros and mesonephros. Instead, they go on to produce the final and permanent set of kidneys – the kidneys that you’ll use for your lifetime – and the third set of kidneys that you made! The first four kidneys are gone by the time you’re born, so it is true that the metaphros is the only set of kidneys that you’re born with. Although, it you’re a male then some remnants of the previous kidneys still remain as part of the reproductive tract – weird, right? !The dance between the MM and the ureteric bud continues, resulting in the formation of nephrons from the MM end, and collecting ducts and ureters from the ureteric bud end. 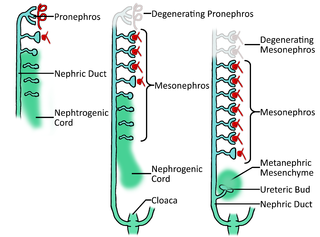 While the pronephros and the mesonephros do not function as kidneys for us, they none the less, are absolutely necessary to get to the metanephros stage. If something goes wrong at one of the first two stages, then the final kidney will either not form at all, or be malformed in some horrible way. As in nearly every case, evolution uses what it has already available to work with, and modifies that in some way to produce new structures, and structures with new functions. It seems that evolution used many of the genetic pathways that were already in place to produce fish kidneys, to eventually get to a mammalian-type kidney, which has many different functions than a fish kidney is required to perform. Wouldn’t it seem more logical to produce the mammalian kidney in a more direct manner, bypassing the unnecessary and complicated steps taken to begin the 1st the 2nd sets of kidneys? This might even have reduced the risk of many types of birth defects in the kidneys, that are so common, but nature does not operate by logic or foresight. Systems that are in place are simply prone toward variation through mutation. Vary rarely one of those mutations may improve the odds of survival, and because there are so many organisms born over long periods of time, these rare advantageous mutations are almost inevitable. Environmental pressures will continue to filter out the disadvantageous variations and increase the advantageous ones in the gene pool. So yes, you’ve had six kidneys and no, you’re not an alien. You’re simply a result of the long process of evolution. Your distant ancestors live on, in you, in the way your genetic programming is constructed and operates.